The Lakers rolled over against the Pistons 4 games to 1 in a series in which they should have been swept. I never thought I'd root for the Pistons, but thankfully all the most dislikable idiots that used to be with them (Isaiah, Laimbeer, Mahorn) are history. I'll always hate those guys for trying to beat up on Jordan and then walking off the court and refusing to shake hands before the last game ended in the 1991 Eastern Conference Championships. But as distasteful as that memory is, that's how much I dislike the Lakers. Lots of people have said they want the Lakers to win because they'd like to see Payton and Malone get a ring, but neither is all that likable despite their greatness in their primes. In his prime, Payton was a great on-the-ball defender, but this year he's just been defensive as people have blamed him, justifiably, for his poor play. Malone, despite his generosity in charity, throws some vicious elbows and turned me off by refusing to play against Magic after Johnson's HIV diagnosis. Shaq was interesting his rookie year, but somewhere along the line he grew disenchanted with the press and switched to a robotic, disaffected, emotionless voice. He's dominant and dull as a butter knife. Rick Reilly once wrote an article in Sports Illustrated claiming Kobe was better than Jordan. Rick Reilly is an idiot so it doesn't mean much, but some people, including perhaps Kobe, seem to believe it. As a longtime Chicagoan, that drives me nuts. Kobe is extremely good, probably the most talented player in the NBA right now, but to call him Jordan's equal, let alone his superior, is silly. The one area where Kobe is better than Jordan is 3-point shooting, and it's possible over his career that he'll remain an athletic slasher for longer than Jordan, but beyond that Jordan is his daddy. Anyway, it's just a long-winded way to say that the Pistons rout made my day. Kobe's shot selection is often terrible. Jordan was a much smarter, more efficient offensive player. It's reflected in their career field goal percentages (.454 for Kobe, .497 for Jordan, dragged down by those two years with the Bullets in which his legs weren't what they once were). 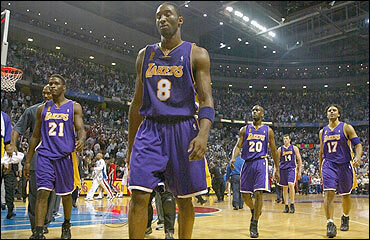 Watching the playoffs this year, it's understandable why some of Kobe exasperates many of his teammates. He takes some ludicrous, foolish forays to the basket, leaving his teammates standing around with their hands down their shorts. That's also reflected in career assist totals. Many claim Kobe has to be more of a playmaker than Jordan, but Kobe has averaged 4.3 assists per game during his career, and Jordan averaged 5.3. When Jordan temporarily played point guard near the end of the 1988-89 season, he rattled off ten triple doubles in eleven games. Rebounding? Jordan averaged 6.3 over his career, Kobe has averaged 5.1. Defensively, Jordan was a better one-on-one and team defender. They don't track enough stats to corroborate it, but Jordan did average 2.3 steals a game for his career (winning 3 steals titles in the process) to Kobe's 1.5, and my sense is that Jordan took his defense more seroiusly than Kobe does on a regular basis. Kobe's not a bad defender. In fact, when he focuses on it, he's the very tough individual defender. It's just that in his prime, Jordan was thought of as the Ron Artest of his team. Jordan won Defensive Player of the Year in 1988 and was named All-Defensive First Team more than any other player. True, Jordan wasn't always the easiest teammate to play with, but he never inspired the type of soap opera that Kobe has in his rivalry with Shaq and his detachment from his other teammates. Finally, we have this year's Finals, in which Kobe shot 42-113 and got shut down by Tayshaun Prince and an aggressive help defense that double or triple teamed him. No offense to Tayshaun Prince, but even the Pistons Bad Boys swarm defense couldn't stop Jordan, and I can't imagine a Jordan led team rolling over so badly in a Finals series. Jordan was too competitive to let something like that happen. If Bryant would just acknowledge his debt to Jordan, pay his due respects to the player whose footsteps he walks in everyday, I'd warm to him. He's as close too Jordan as any player in the NBA in physique, style, talent, ambition, marketing strategy, and personality, but he's not Jordan. All this is just a long-winded explanation for why the Pistons victory pleased me more than the usual schadenfreude.